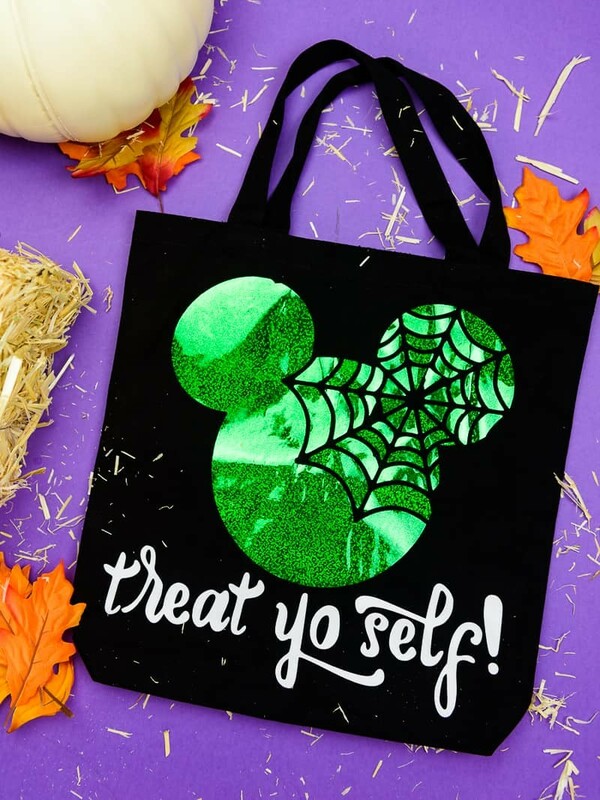 Show off your Disney side with this Treat Yo Self Halloween Trick or Treat Bag! It’s officially my FAVORITE time of the year! Both of those things are worth a trip, FOR SURE. There’s nothing I love more than sipping on a cocktail and eating my way around Epcot during the day and then hanging out with the Sanderson sisters in the Kingdom later that night. It’s quite possibly my favorite kind of day. This year we went to Mickey’s Not So Scary Halloween Party in September and had a blast! Even before we had our toddler we liked to trick or treat just a bit so we had candy to snack on while waiting for the parades and fireworks shows. We didn’t want to miss anything by getting food during the party so we would go to a few stations and get a few handfuls of candy before grabbing our seats for the shows. It’s worked out well in the past and we always thought this was the best way to do things. Why change something when it works, right? This year we changed up the way we do the party and had the best time we’ve ever had at a Disney event! There was a lot of trick or treating, lots of character meet-and-greets, and even a less-crowded and more enjoyable space to watch the parade from. I can’t complain about one thing from the party this year. It was a blast. About two days before we left for Disney I got an idea and just needed to make our own Halloween trick or treat bag for the party. Disney actually gives you small plastic bags to use to trick or treat with but I wasn’t really a huge fan of them. And since we decided we wanted to trick or treat a lot this visit, I wanted a bigger bag. So I made them. Originally I wanted to do something that would match our Toy Story costumes but I just wasn’t in love with anything I came up. Plus, I wanted to be able to use these bags for years to come so I didn’t want to get too deep into a theme. The only requirement I had was that the toddler’s bag had to have green (or teal) on it so I’d know it was our allergy-friendly candy bag. (you can read more about the Teal Pumpkin Project here). I settled on Mickey and Minnie bags that have spider webs with a little Parks & Rec humor mixed in. They came out perfectly and I could not be happier with them! Plus I know that they’ll be Halloween trick or treat bags that we can use for years! And really, aren’t those the best kind of projects? takes 10 minutes from start to finish! 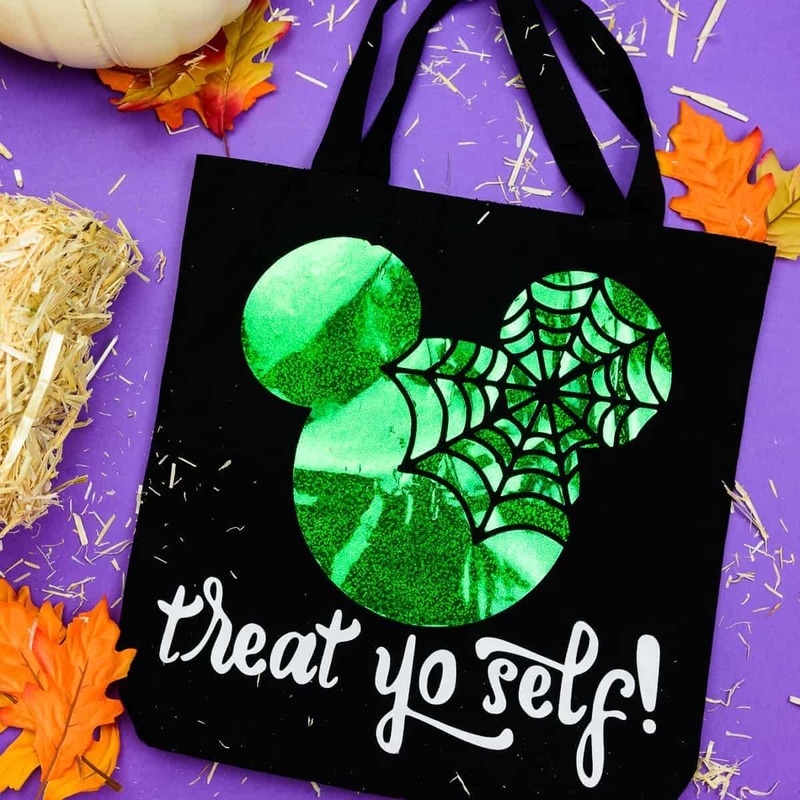 Treat yo Self with this easy Mickey Mouse Halloween trick or treat bag! It takes 10 minutes from start to finish and you can use it for years to come! Grab your file and open it in the Silhouette Software. Load your vinyl in your machine (shiny side down). After your design is cut, weed it and put it aside. Pull out your Halloween trick or treat tote bag and quickly iron out the creases (I use my EasyPress to do this!). Fold the bag in half and iron it. You should be able to see a nice crease right down the middle when you unfold it. This will help you line up your design! Place your design on the bag. If there are multiple pieces to the design, only do one at a time and always start with the main image (in this case, it's Mickey). Place your teflon sheet on top of your design and press. Refer to your EasyPress to check what temperature and for how long. Continue to place all of your design on the bag and press until it is all adhered to your bag. You can use glow in the dark vinyl for Mickey's head too, which would look really cool at night! There are a lot of Silhouette/Cricut groups on Facebook that you can get files from (for personal use!). If you are not comfortable designing then this is a great way to grab cute files to use! To find groups use the search bar and type "SILHOUETTE" or "CRICUT" and a bunch will come up! The TREAT YO SELF text is from Cori George at Hey, Let's Make Stuff. You can grab her free download here! 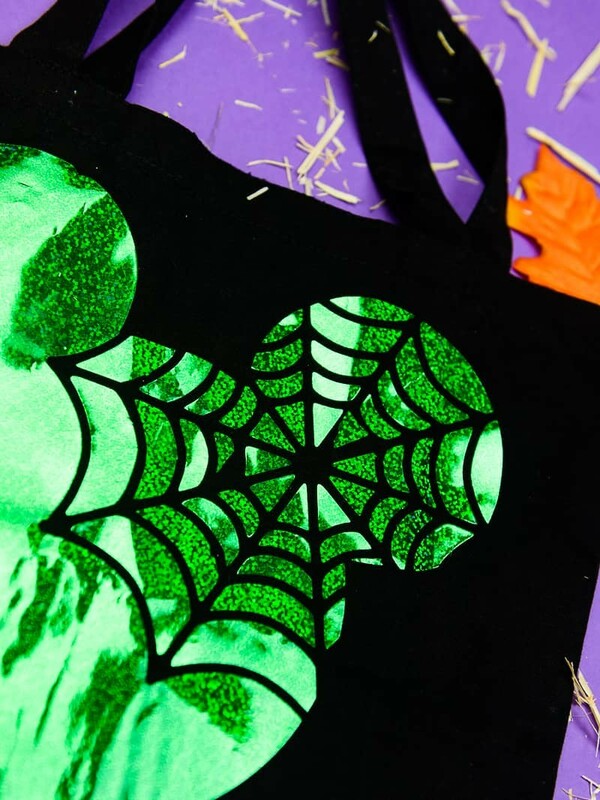 This Halloween trick or treat bag is so simple to make and they look so cute! We love ours and can’t wait to use them in a few weeks. And with lots of vinyl color choices these bags are custom and fit each of our personalities! Need a few more Halloween decor ideas? Check these out!